Both children and adults alike copy the behavior of others in some way or another. For example, the brain of a child is like a sponge – it soaks up and absorbs actions they see others do and what they hear others say. Sure enough, what they see something that you or someone else does, they are doing it themselves almost instantly. We know people follow the behavior of others whether they copy an action of a role model, friend, parent or complete stranger, but does that apply to animals, too? According to a study conducted by German scientists at the University of Regensburg, domestic horses are capable of social cognition. For starters, social cognition is the study of how people and animals process social information. For example, do you remember how you learned how to cook? You probably picked up your cooking skills by watching your mother in the kitchen or from cooking shows on TV. In other words, you learned by observing others. The theory of social cognition is that people and animals both learn by observing others. According to a recent article in EquiMed discussing the German study, scientists involved found that whether a horse learns new behavior or not is based on their social status. With breed type aside, horses will only pick up on the behavior of another horse they were watching if they share a special relationship. First, the scientists observed the “following behavior” between horses and people. One horse reacted to a trainer in the arena by following him or her around. Meanwhile, they had a horse near the riding arena watching this event take place. If the horse the bystander was watching was dominant in social status, they would instantly copy the following behavior. On the other hand, the bystander wouldn’t immediately follow the trainer in the arena if they had previously observed a subordinate horse. Another observation made was that a horse didn’t follow the behavior of another horse if the two horses were from different social groups and didn’t know each other. Based on this study, it’s “monkey see, monkey do” with horses – but only in certain circumstances. It may also provide some additional insights for you on why some horses misbehave or refuse to follow directions or cues. Knowing this may help you make adjustments in your training or practice regimen and help make your horses more responsive and cooperative with exercises. Of course, at the end of the day, your whole horse family needs a roof over their head and a place to stay warm and dry. At Deer Creek Structures, we offer top quality barns that are sure to house your animals securely. 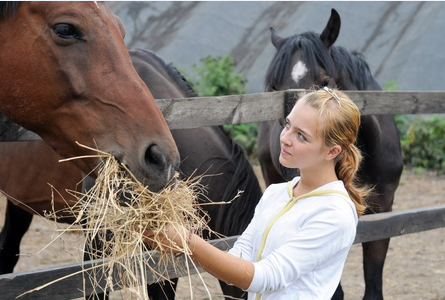 To learn more or to order a new barn for your property, call us today at 254-546-2276.